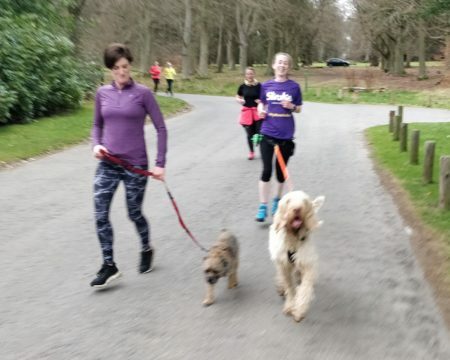 The quest to complete every parkrun in Scotland continued with a trip to Dundee to take on the famous hills of Camperdown park. We arrived on Friday evening and found a nearby forest place to park up for the night. It turned out to be an inexplicably popular spot.. up until about two in the morning there were quite a few cars arriving, staying for half an hour then leaving again. Or maybe the same car over and over.. we didn’t dare look. Our day started bright and early helping to set up the course before heading off for a spot of volunteer car park marshalling. This turned out to be more of a challenge than it sounds. All we had to do.. ALL we had to do was stop people from parking on the verges. How hard could that be?? I mean there is loads of parking in the estate. 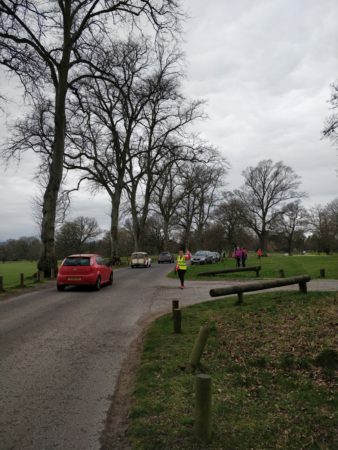 Well as it turned out people who are running 5K don’t like walking an extra 200m so as we kept the verges at one end clear people drove past us and parked on the verges at the other while our backs were turned.. Honestly, it was like herding cats. 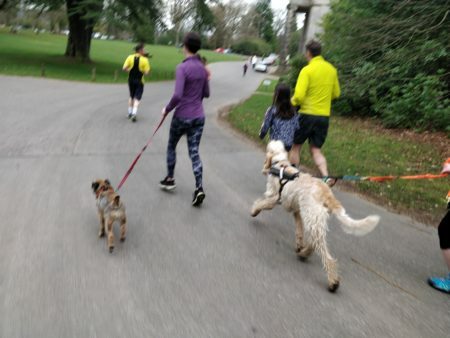 It’s always strange to see parkrunners converge. 9:05 there’s no one there apart from the run team.. 9:20 the place is mobbed. We kept parking order as best we could then headed off to catch the pre-run briefing and get ready for the start. 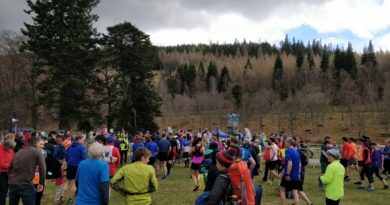 There were a couple of hundred runners and, once again, the weather gods were smiling on us as spring well and truly took hold. Camperdown Park is huge, so there was one big loop to run, we were getting used to multiple laps of late. 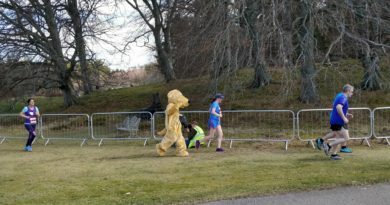 It was then that we first met Rufus, who was warming up for the 5k. Mostly he was warming up his tail muscles. During the briefing Tom the RD had said there was a Horse taking part. Has to be said the aforementioned Rufus would certainly have suited a saddle… he was a BIG dog. The run set off and after a couple of hundred meters Rufus went barreling past us with his owner in tow. 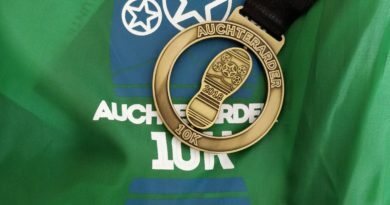 Never mind a PB, getting dragged round by that pooch would set a world record, or so we thought. Rufus had other ideas though. It turned out the early burst of speed was to catch his friend, a little border terrier called Hugo. And this is where the problems started. You see Hugo was far too intelligent for this parkrun thing. He wasn’t overly keen on the running when there were far more interesting things to sniff and roll in. Rufus wasn’t going anywhere without his little pal. So when Hugo stopped for a drink in a little stream we crossed Rufus ran on until he noticed his buddy wasn’t there and then tried to turn back to find him. The owners tried everything, at one point Hugo even insisted on being carried with Rufus running alongside. 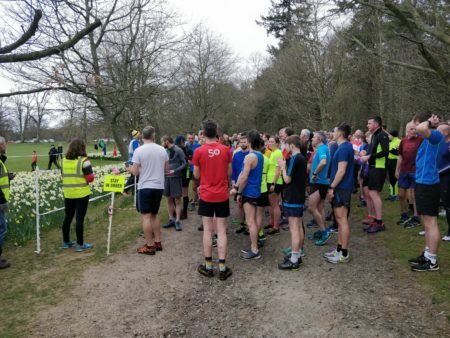 This was turning into one of the most entertaining parkruns ever. The antics of the two pooches was taking our mind off the fact that, well, the course’s reputation had lied to us. We were told it was hilly but it wasn’t. There was only one hill to negotiate, it’s just that it goes on for about 2K !! It was a pretty place though. After the long uphill drag there is a nice downhill tarmac bit that takes you past the big house. Then it’s trail all the way to the finish. There is a last minute scare as you head up through the woods and see a big hill in front of you. Thankfully you take a left turn to the finish before you have to go up. Camperdown had turned out to be as tough as we were warned it’d be but that didn’t stop us having a great time. An interesting and varied route always helps, and this is one of the nicest we’ve ran.